Rama is often depicted as a very soft-natured person but on the battlefield his shourya-parakrama are unbeatable. He is truly a warrior at heart. After Shoorpanaka’s episode, 14000 warriors march past to attack Rama. Instead of seeking help from Lakshmana in the war, he gently asks Lakshmana to take Seetha and relax in the nearby cave. Seetha on the other hand is quite stunned, for she has never seen Rama’s dexterity at war. With enemies all around him, he fights the whole war himself standing at the center with 1 : 14,000 ratio, while Seetha who watches all this from the cave eventually realizes that her husband is a one-man-army, One has to read the Ramayana to understand the beauty of this episode. 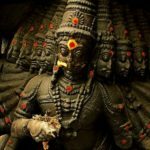 Embodiment of Dharma – Ramo Vigrahavan Dharmaha! While leaving Ayodhya, Kausalya requests him in various ways to stay back. With lot of affection, she even tries to take advantage of his nature of adhering to dharma by saying that it is the son’s duty according to dharma to fulfill the wishes of his mother. In this manner, she asks him that isn’t it against dharma for Rama to leave Ayodhya? Rama replies detailing further dharma that it is certainly one’s duty to fulfill his mother’s wishes but dharma also has it that when there is a contradiction between mother’s wish and father’s wish, the son must follow the father’s wish. This is a dharma sookshma. 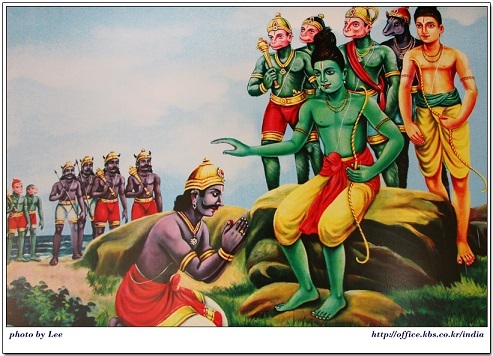 During the initial days of exile, Seetha asks Rama detailing the dharma of exile. She tells, “During the time of exile one has to conduct himself peacefully like an ascetic, So is it not against dharma that you carry your bows and arrows during exile?” Rama replies with further insights into the dharma of exile, “Seetha! One’s swadharma (own dharma) takes higher priority than the dharma that has to be followed according to the situation. My foremost duty (swadharma) is to protect people and dharma as a kshatriya, so according to the tenets of dharma, this takes the top most priority in spite of the fact that we are in exile. In fact, I am even ready to give up on you, who are my most beloved, but I will never give up on my swadharmanushtana. Such is my adherence to dharma. So it is not incorrect for me to carry bows and arrows in spite of being in exile.” This episode happened during the vanvas. These words of Rama show his steadfast devotion to dharma. They also give us an insight into what could have been Rama’s mental state when he was forced to place his duty as a king even higher than his duty as a husband (i.e during the times of agnipareeksha and Seetha’s exile later) as per the rules of dharma. 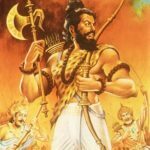 These are some instances in Ramayana that depict that Rama’s every single move was taken after considering all the subtleties of dharma which is often obscure and misunderstood by most of the people. Rama was deeply in love with Seetha by heart, mind and soul. Despite having the option to marry again, he chose to remain with her forever. He was so in love with Seetha that when she was kidnapped by Ravana, he writhed in pain wailing Seethaa Seethaa falling on ground crying like a mad man even in front of the vanaras totally forgetting all his stature as a king. In fact, In Ramayana it is mentioned many times that Rama often shed so many tears for Seetha that he lost all his strength in crying and often fell down unconscious. It is said that chanting the name of Rama burns away the sins and confers peace. There is also a hidden mystic meaning behind this connotation. According to mantra shastra, Ra is an Agni beeja which embeds within it the fire principle when uttered burns (sins) and Ma corresponds to the Soma principle which when uttered cools (confers peace). Meaning: The Name of Rama is as Great as the Thousand Names of God (Vishnu Sahasranama).